As we previously reported, Drivers United aren’t merely hoping to restore the per-mile rate that previously was in place. Workers are hoping to win guaranteed minimum pay similar to what New York recently voted to enact, as well as a 10-percent commission cap for rideshare companies, and an end to driver deactivations without just cause. Supporting the strike effort were the New York Taxi Workers Alliance, Amalgamated Transit Union, the National Union of Healthcare Workers, and 2020 presidential hopeful Senator Bernie Sanders. “Uber and Lyft continue to destroy drivers’ lives, leaving them in poverty and debt, as the companies saturate streets, cut rates and syphon revenue from passenger fares into their own pockets,” NYTWA wrote in a statement to press. Uber declined to provide a comment. 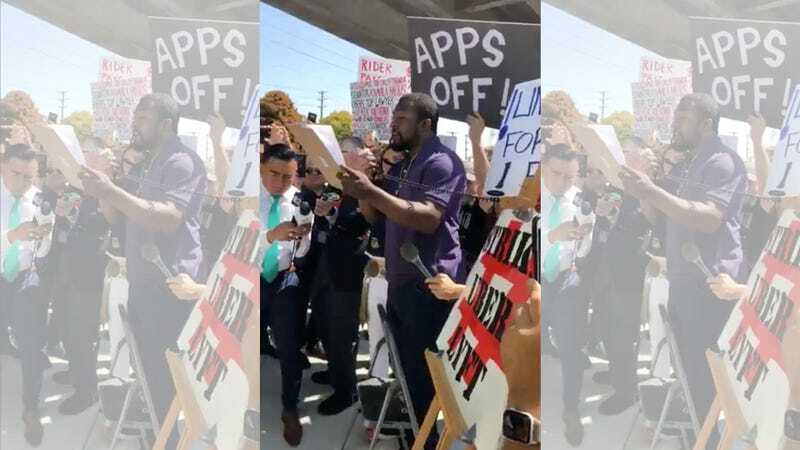 Drivers United’s picket and 25-hour protest are timed around Lyft’s recent initial public offering and Uber’s upcoming public offering. (It’s no surprise, then, that “homeless drivers with nowhere to go / say hell no to the IPO” was among the first chants at today’s picket.) Gig Workers Rising, a similar coalition, organized in San Fransisco today to directly disrupt Lyft’s IPO roadshow. The protesters intend to continue picketing outside the Greenlight Hub until 3pm local time. They then intend to march to an LAX parking lot where they hope to convince incoming fliers to avoid ridersharing apps until the strike ends.